I have a confession to make: I'm addicted to eBay. My husband always falls asleep before I do, so I wait until I hear him snoring, and then, BAM! I open up the eBay app on my iPhone and start shopping! This is probably not a good habit, since I already have too many nail polishes and other random crap, but I can't help it. I haven't gotten to the point of needing an intervention or an episode of "Hoarders" yet, so I think I'm doing OK. Anyway, I have two hauls to share with you today from my late-night eBay sessions. Basically, I don't bid on nail polish unless (1) it's extremely cheap or (2) contains one of my long-time lemmings. In November, I found a deal by eBay seller "sexytrxy" for a damaged lot of Wet n Wild polishes. From the pictures and my communication with her, the polishes worked fine; they just had polish on them from other bottles. I bid on them, and won the auction for just $1.04. Shipping was $4.99, so I ended up with 10 Wet n Wild polishes for just $6.03! This auction lot included "Limitless," "Flirty Rose Creme," "Femme Fatale," "Deep Wine," "Nail Fortifier," "Heart's Desire," "Inferno," and "Jade," as well as two unnamed polishes. I didn't have any of these colors, so I was happy to get them for about 60 cents a bottle. Yup! Tucked in between a $1 Art Deco polish and a mid-price CG polish was "Ruby Slippers" by Essie! This is one of my top lemming polishes, so I just HAD to bid on this auction! Luckily for me, I was able to get this auction lot for just $7.99 plus $5 shipping. 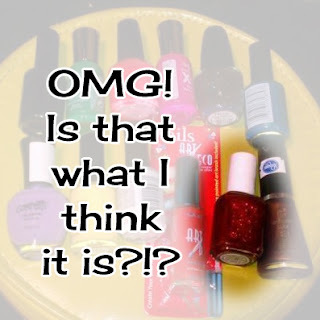 That means I got my "Ruby Slippers" and 11 other nail polishes, including 2 Sally Hansen Xtreme Wears, for just $12.63. Again, I got a dozen polishes for about a buck each! Woohoo! 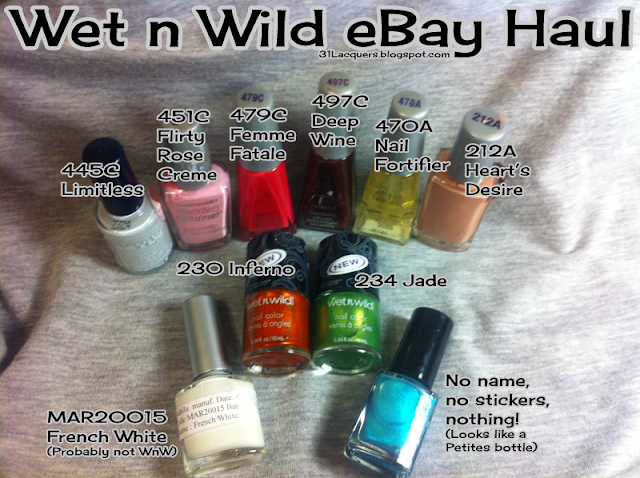 I received two Sally Hansen Xtreme Wear polishes in "Going Green" and "Twisted Pink;" L.A. Colors' "Rainbow Glitter;" Cover Girl Continuous Color "Copper-cino;" my first Confetti polish in "Belle of the Ball;" my first LaRosa polish, a crackle in "Hot Orange;" L.A. Colors Art Deco striping polish in "Bright Orange;" two more N.Y.C. polishes in "French White Tip" and "Empire State Blue;" my first two Shades of the Seasons polishes in "Black" and "Yellow;" and my first Essie polish, the fantabulous "Ruby Slippers." AWESOMESAUCE! I've got another eBay haul coming from an auction I won this morning, and I think I can finally say that I don't need to stalk eBay for rare OPIs... I can't wait to share the results from that haul with you! If you've read my other blog posts, you should be able to guess which VHTF OPI I've finally acquired! Wooohooo!